Editor/Author Yolton, John, Rogers, Pat and Porter, Roy, et.al. 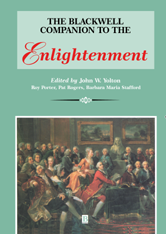 The Companion focuses on the international intellectual movement of the Enlightenment, and the individuals who shaped it. A number of substantial essays survey the main topics of dictionaries, encyclopedias, art, music and theatre, while central philosophical concepts such as human nature are also examined. Specialized topics receive short definitions and there are several hundred biographies.